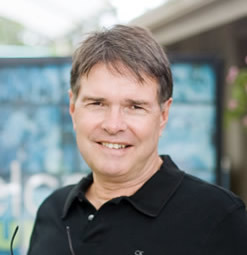 Ralph Moore is the Founding Pastor of three churches. He and his wife, Ruby, currently pastor Hope Chapel Honolulu. He spends his free time walking, reading and hanging out at the pool. Like his preaching, his written words deliver solid truth in a humorous and unassuming manner. Beginning with just 12 people, the Hope Chapel 'movement' now numbers over 2,300 churches, worldwide. These are the offspring of the 70+ congregations launched from Ralph's hands-on disciplemaking efforts. Ralph currently travels the globe, teaching church multiplication to pastors in startup movements. He's authored several books, including Let Go Of the Ring: The Hope Chapel Story, Making Disciples, How to Multiply Your Church, Starting a New Church, and Defeating Anxiety. Catch his blog at www.ralphmoore.net. Think about the people who've invested in you and helped you become the person you are today. God puts just the right people, at just the right time, in just the right place, to speak just the right things into our lives. Most of us can name at least three hero-makers who've had a profound impact on who we've become. Here's the cool thing... God intends for each of us to be hero-makers-- people who make heroes of others. Our greatest legacy in eternity will be measured not by what we've done, but instead by the people we've invested in. The key question is this... will we see ourselves as the HERO at the center of our story, or will we be the HEROMAKER of others at the center of God's story? Multiplication starts in the heart of the leader. It starts with each of us surrendering the "hero complex" to a better way. It requires that we shift from being heroes to becoming hero-makers of others. We must put to death measures of success that require us to win, opting instead to assist others in winning. Convenient locations: 5 cities across the U.S. Please tell us your HeroMaker story! Use your smartphone or the webcam on your computer to record a 1-2 minute video clip, similar to the one above. Identify a person who has helped shape you into the person you are today. Tell how that person had a significant impact on you. Share your video on Twitter, Facebook and / or Instagram. Use the hashtags #HeroMaker and #Exponential. Send an email to support@exponential.org to give us the link to your video. We will select specific videos to feature on our website and in our weekly newsletter. Your posted video gives you a chance to win FREE tickets to an Exponential HeroMaker event.